Is it possible to install without running an executable file? I don’t have admin access to my PC to run exe extensions. Yes, the download is an add-in file and does NOT include an executable file. Thanks! I landed on one of your YouTube videos around 9pm and it is currently 3am and I’m still exploring your website. I have a MacBook and 2 windows laptops that I use for different purposes. How do I purchase all these add-in sand make then available on all 3 machines? Do I need to buy each 3 times? I’ve ecome a big fan and I’m only beginning. Thank you so much for your support! I’m happy to hear you are enjoying the site. You will be able to use PivotPal on up to 3 computers that you own at any one time. So if you get new computers in the future, you can use it there too. PivotPal only works on the Windows versions of Excel. It will NOT work on the Mac. I already emailed you about this, but just wanted to post here for anyone else that had the same question. Thanks again! I have the latest version of Office 365 will this work on this new version? Yes, PivotPal will work with Office 365 as long as you are using Windows. The latest version of Excel for O365 is Excel 2016. I hope that helps. Please let me know if you have any other questions. Thanks! I have Office 365 on a mac and MacBook pro. Both use Sierra OS. will it work with either? If not, when will it be available? Unfortunately, PivotPal is not compatible with the Mac versions of Excel. The latest version of Excel for Mac (2016) does not include developer tools that make this type of add-in possible to run. Hopefully Microsoft will update this in the future, but I’m not sure when they are planning to do that. You can vote for that feature of improving the VB Editor on the Excel User Voice Site. Microsoft does read this, and every vote counts. So I encourage everyone to vote for this if you are interested in using VBA macros and add-ins on the Mac. Thanks! I used pivots daily for years as an analyst, ended up getting me to places I never would have imagined. Now I’m not using them as much so your tutorials are the bomb in terms of refreshing my brain! I’m going to purchase PivotPal because I see the value in its efficiency. I now am using 2016 Excel and it is an absolute nightmare in my opinion, my efficiency in creating one PivotTable has decreased by at least 50%. I already see that your tool isn’t this Mickey Mouse make me feel like I need help analyzing data program (the keyboard command options are a great idea). From what I see your program makes me feel like I’m going to be working with the old versions of excel that had great flexibility. I’m also telling all the guys at work that I have now met the new Jesus. I have been getting into the habit of using pivotpal and it is a very useful tool. Saving favourite layouts for a pivot table is such a useful feature. It would great if there was an option to click on a pivot table and capture the layout already set. I’m so happy to hear that PivotPal is helping you. That is a great suggestion! Unfortunately, not all the options can be read from existing pivot tables. But it is something I will look into adding in the future. I have an daily updated database. And I give a 10 pivot report based on this database. We have 5 branches so daily I click many pivots for the latest date and then for the each branch. Plus I present these pivots in pdf format, so each time the pivot changes either there is a huge gap in the excel (because I put the pivots together) or the pivots overlaps so I manually pull the pivot elsewhere. Would pivotpal will help with my problem? PivotPal will not directly help with that issue. However, I have an article on how to filter pivot tables for the latest date or period that might help. Thanks! We are in the process of converting over some applications from Essbase to Microsoft SSAS 2012. One of the biggest stumbling blocks is suppressing zero rows in the final OLAP Pivot table. Somehow Excel 2013 can’t handle it gracefully, and in some instances we are forced to seek an SSRS Solution using MDX query as the source & filtering zero rows inside of the SSRS object. If we using the filter in Excel 2013, it first computes the sum across rows and then applies the filter. So if you had 2 measures in your output, one w -$1000 value and another w +$1000 values, it will eliminate that row which we need to see. Most tools like Essbase have this built in, so we were wondering if PivotPal supports this functionality? Thank you for your question. I’m not sure I fully understand your question, but I don’t believe PivotPal has a feature to help with this. If the rows with zero values are filtered out of the data source, then the pivot table is not going to be able to display them in the pivot. Is that the row you need to see in the pivot? Thank you for your reply and sorry for getting back to you so late. Somehow I didn’t see this in my inbox! Basically the final MDX (from the OLAP Cube) returns a mixed bag. Lets say we have 2 columns (Amounts) of information. There could be some rows that have zeros in both columns, some rows that have flipped values – example Amount of positive 100 and negative 100. If I use Excel filter, it will eliminate the first set (zero rows) but eliminate the second set (+ 100 and -100) as well which we don’t want. Most Report Tools have a way of saying “Suppress Zero Rows” which will only eliminate zero rows i.e. the first set. I wanted an easy add-in w OLAP Pivot table that does this. Hope this explains! I’ve tried all sorts of ways to resolve this like redefining source data etc but this is a waste of time. Will PivotPal be able to help identify exact errors in specific PivotTables and either auto-correct for me or advise specifically which tables which need to be fixed? I believe that error message is caused when the first data row contains blank cells. Is this the case for you? PivotPal does not have a feature that identifies that error specifically. I found your tutorials for pivot tables, charts and dashboards on YouTube. I need to learn how to use these features for my job. Thank you so much for such a clear explanation of the features and how to manipulate them. And now you’ve got me excited about PivotPal. (Love the name, by the way! 😀 ) I’ll be mentioning your product to my employer and explain how much easier it is to create pivot tables and charts with it. I use pivots a lot and a repetitive step I make every time is go to totals and uncheck “show grand totals” and display “Classic PivotTable Layout” Can these steps be automated with the layout settings? Thanks. Yes, absolutely! You can create a layout profile with the My Pivot Layouts feature that turns the Grand Totals Off and changes the pivot table to the Classic Layout. I created a quick screencast so you can see this in action. In the screencast I first create the layout profile. Once the profile is saved, it can be applied to any existing or new pivot table. This just automates the process by applying all the layout steps with less clicks. Your co-workers and users of your workbooks will still be able to view and modify the pivot tables. Hey sir i cannnot see the insert tab in my excel…it is showing Home then Layout Button then tables then charts what could be the missing link? You might have disabled the tab at some point. Right-click on any tab name in the ribbon, then choose “Customize the Ribbon…”. On the right side of that window you will see a list of the ribbon tabs. Make sure the Insert tab box is checked, then press OK. That will enable the Insert tab on the ribbon. I hope that helps. I would like to thank you for your info. I want to know if the pivotPal will work for excel 2016 for mac. PivotPal does not work on the Mac version of Excel. Currently that version does not really work well with add-ins. Hopefully that will change in the future. Thanks! Yes, PivotPal works with Excel 2007. Please let me know if you have any other questions. Thanks! I have been using powerpivot extensively since past 4 years in the office and home alike. Now I would like to buy the Pivot Pal. If bought one license of PIVOT PAL, can I install it in both my personal PC and office PC since office PC is not owned by me. Yes, you can install PivotPal on up to 3 computers that you own at any one time. So if you get new computers in the future you can install it on those as well. Please let me know if you have any questions. Hi Jon, is there a version for Excel 2016? Yes, PivotPal is compatible with Excel 2016 for Windows. I just updated the page to reflect that as well. Please let me know if you have any other questions. Thanks! I created by Power Pivot model with data from Access, I added a new field in my Access table what do I need to do to bring the new field to the Power Pivot model? You just need to refresh the table in Power Pivot. Let me know if that helps. Thanks! I refreshed the Power Pivot but I am still missing the new field, I established a new connection with the same table in the same model and the tab have my new field. What I don’t want is to redo my whole model. Your Pivotcharts videos are awesome…They make life simple…!! I have a quick question, Can we plot box plots in Pivot charts? I have Version 1.0 of PivotPal. Are there any updates available? I have created an add-in for aligning the elements in the chart. I call it the Chart Alignment Add-in. That is the only one I have right now. Does PowerPivot work with office 365? Are you referring to my PivotPal add-in. If so, it works on all versions of Excel for Windows. So it will work with Office 365 if you are running a desktop version on Windows. thank you so very much for this information, very thorough with clear and concise tricks of the trade. Anyone has upgraded to Office 365, for mac especially? I found a problem that I can’t select multiple items on the slicer for custom selection. The shift function still works for consecutive selection, but the Cmd doesn’t work for custom selection. Does the Ctrl key work? I don’t have my Mac up right now, but I know they changed a lot of the keyboard shortcuts for 2016. I am unable to found pivot pal tab in my excel sheet. Can u help me how i fix this problem. Did you purchase PivotPal yet? You will first need to purchase PivotPal, then download and install it. Let me know if you have any other questions. Thanks! I just finished the series of 3 introductory videos on Pivot tables, graphs and dashboards. Thank you! That was one of the best presentations I have found on this topic; easy to follow and logically presented. I look forward to getting Pivot Pal. My applications will be to data and survey results. Do you have any templates that have been used to analyze scientific and demographic data? Thank you Mark! I really appreciate the positive feedback. I don’t have any templates for survey data, but I am probably going to do a blog post on it in the near future. I think it is a great topic and have had a few other questions about it. Thanks again and have a good one! Yes, unfortunately the Power Query and Power Pivot features are not available for the Mac versions of Excel. I know people that use Parallels or Bootcamp to run Windows on their Mac so they can use the Windows versions of Excel. If I only used Mac I would do this as well. For me, the power and time saving features of the Power tools would be worth it. My PivotPal add-in currently only works on the Windows versions of Excel. The Mac 2016 version is very limited on programability with VBA, and I probably won’t be able to create a version of PivotPal for Mac until that changes. Thanks for the reply regarding MAC for Excel 2016. Microsoft developers has told me in the there are working to add the fully functional VBA and SQL Editor mode just like Microsoft Office 2011 MAC. If that happens will you add your products in MAC for Excel 2016. I am not sure whether power pivot or power queries will be added in MAC OSX. But definitely VBA and SQL Editor mode will be fully functional like windows. I hope to make products for the Mac versions. Honestly, a lot will depend on how stable those future builds are. In the past it has been very difficult to program for the Mac versions. I always try to stay optimistic and hope that will change in the future. Time will tell… 🙂 Thanks! John, I will look into bootcamp or Parallel option down the road if I need features like pivot table, Power Queries and Pivot Charts and Power BI Tools. Most of my jobs right now does not deal with those features. I am mainly dealing with analyzing financial model and using analysis tool pack and charts. Right now it does not make sense throwing approx $200 extra for Windows 10 OS plus Parallel software for additional features in Windows Excel that I am not going to need. Honestly, I would like Macros and VBA Editor mode to come back from 2011 version to 2016. I sometimes like to create user defined functions using VBA editor mode which currently I can’t do. I was told by Microsoft that Macros and full VBA/SQL Editor mode will be be present similar to 2011 MAC Excel. Most likely the next software upgrade will have that features added back. Again I don’t see any use right now. If I need those feature, then I will have no choice and have to get Windows Excel. But for right now MAC Excel is fine for me..
Do you know what is causing this? The tool still functions without issue. I’m not exactly sure what would cause that. Is that happening on all your files that contain pivot tables? If so, are you using the English language version of Excel? Thanks! I continue to encounter a problem with PivotPal, Filtersource does not work, GoTo Data is greyed out. I followed the instructions, tested on several Excel files but cannot get it to work. Those buttons will be disabled if the source data is in another workbook or part of the data model. Clicking the small “i” icon to the right of the pivot table drop-down at the top of the PivotPal window will show you a list of all your pivot tables in the workbook. The second column in that list displays the source range for each pivot table. Are the source ranges in the same workbook, or a different workbook. Thanks for the info. Great work! I am using Pivots extensively for various display functions. In most cases I do have large data set/source on which I define a pivot. Instead of having various pivots to show the relevant data, I was playing with the idea (in VBA) to create “Pivot Views”. Where a Pivot view is particular combination of pages with the given page selection, rows, columns, format, etc. and then save the view, with a view name, in the given xl workbook. This Pivot view option would allow the selection of a given view and then it would adjust the one pivot table accordingly and the associated pivot graph after it has been selected. My challenge is to get the given Pivot environment, (page, columns, rows, formats etc.) and then saving it. Q1: Have you done something like this? Q2: Could you point me to relevant information regarding this. That is a great question. I was actually planning on adding a feature like that to PivotPal. Right now there is a Pivot Layouts feature that allows you to create custom profiles to save layout settings, and quickly apply them. A similar feature could be created for the entire Pivot Table including the fields in the areas of the pivot. It’s quite a bit of work to program because you are inevitably going to want the filters to be saved and applied as well. There are a lot of properties and settings you have to store. Then if the user changes field names you also have to handle those potential errors. It’s definitely possible, just not sure when I will have time to add the feature. Does my purchase of PivotPal include future updates? You mentioned that you are working on some updates based on requests/suggestions from others, so I just want to confirm that the updates will be distributed to existing customers free of charge. Yes, your purchase includes all future upgrades to PivotPal, free of charge. Please let me know if you have any other questions. I want to know, whether your Pivot Pal can customise the layout, where I want two fields next to each other, not under, and the summary of the first field in the third column. 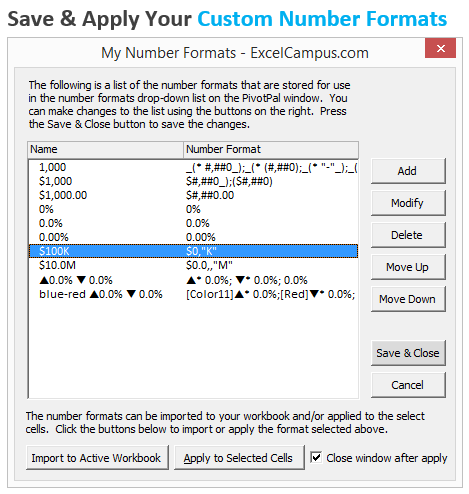 PivotPal allows you to customize the settings and layouts that are built into Excel. 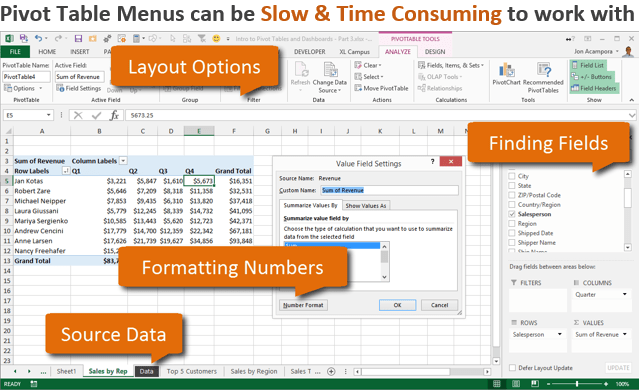 If it is a layout that you can achieve in Excel, then PivotPal will make it faster to achieve that result. I’m not exactly sure if I understand your layout. Feel free to email me your file with the layout if you’d like. jon@excelcampus.com. I’d be happy to take a look. Is there a free trial version of Pivot pal that I could download and give it a stab? Sorry, I don’t have a trial version right now. I do offer a full 90-day money back guarantee. If you are not satisfied for any reason you can get your money back. Thanks and have a great day! If I send an excel spreadsheet where I have used PivotPal, to another person who does not have Pivot Pal, will they be able to see all the results the same as I do? Great question! No, the other users do not have to have PivotPal. PivotPal will just help you build and modify normal pivot tables faster. It does NOT add anything extra to the Excel file. You can still modify the pivot tables with all the built-in tools in Excel. My apologies for not getting back to you sooner! Please let me know if you have any other questions. Thanks again and have a great day! If I order PivotPal, do I get a CD or just a download? You will just download the file and install it on your computer. You can back it up on an external drive or CD if you’d like. Please let me know if you have any other questions. thanks for a great tool! Does it have an ability to clear the Slicers choices? I have a worksheet with over 30 of them each controlling about the same number of small Pivot tables (each Slicer controls all of them) and when many choices are made it takes time to clear the filters. That’s a great suggestion. I’ve had some other requests for working with Slicers, and I agree that the ability to clear or set the filters would be great. I’ll put it on the list. Thanks! I was very impressed with your video on pivot tables and with your Pivot Pal add on feature. Q. Can I download and use PivotPal and use it on my MacExcel program? Thank you for the comment! Unfortunately, PivotPal is not compatible with the Mac version of Excel. I plan to have a Mac version in the future, but the timing will depend on the release of Excel 2016 for Mac. To answer your 2nd question, no other users will not need to have PivotPal to use the document. 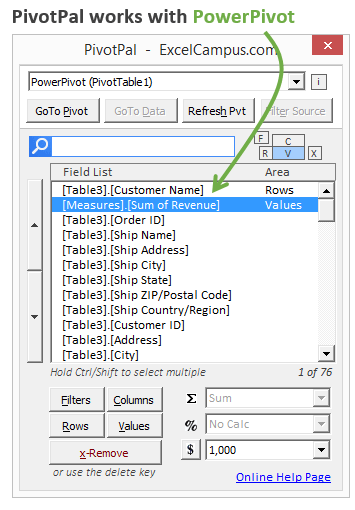 PivotPal just controls the pivot table properties and settings that you would normally apply manually. It does not add any additional code or anything to the workbook. I am a Mac user I have Office 2016 installed – if Pivot Pal available for this version yet? PivotPal is not available for the 2016 Mac version yet. Unfortunately, VBA is not fully integrated with the Mac 2016 version yet, so it will be impossible to develop for it until Microsoft develops this further. Thanks! Looking for the MAC version as well. Please add my to the list too Jon – the Mac list! I use Office 2011 and just started with 2016 ( for Mac). I have one workbook that I have to filter/format/layout the same way repeatedly because I get it from other people. Even worse (at least at this point, until I totally change how the data gets recompiled for other tasks), I have about four different filter/format/layout combinations that the same base file STYLE (usually not the same exact file), so I’m doing a lot of a reapplication of the same filters/formats/layouts. Obviously, something like your tool seems appealing to me! However, I’m wondering how many steps there would actually still be. Right now, I tend to make the layout changes (remove buttons, remove subtotals, grand totals only for rows, etc. ), then suspend pivot updates to rearrange all the fields, then apply those changes, and then apply filters manually. It doesn’t take too long, maybe a minute, but it’s so repetitive that it definitely adds up! Could you confirm/clarify the following? : It looks like I’d be able to apply a pre-saved custom format in one step, then go to another part of the add-in to arrange the fields, and that I’d then still have to apply any filters manually (like actually selecting which data should show and which shouldn’t, e.g. filtering for a particular product season code). Is that right? If so, I’m not sure if the add-in would really truly save me that much time, though it still may be worth it – I’m on the fence, frankly. It’d be lovely if I could add the final filtering of the pivot to certain codes right from add-in, but it doesn’t look like that’s an option, right? I just want to be clear about what I’m getting up front, if possible. Am I understanding this correctly? Have any questions? I hope my description has been clear. Great questions! I believe I understand your process and I will try to answer as best I can. Here are the steps as you listed, and PivotPal’s current capabilities. Make the layout changes (remove buttons, remove subtotals, grand totals only for rows, etc.) – Yes, the Pivot Layouts tool will allow you to apply all your layout options in one step. Currently this is in a separate window from PivotPal, so it would require you to open a different window to apply the layout. However, I am planning to put the layouts drop-down in the PivotPal window in the next release. Suspend pivot updates to rearrange all the fields – PivotPal does not currently have an option for this, but I will be adding it. Then go to another part of the add-in to arrange the fields – Yes, you would have to open the PivotPal window to rearrange the fields. This can be done from the right-click menu from any cell in the pivot table, from a keyboard shortcut assigned to the QAT, or a button on the ribbon. You can have the Layouts menu and PivotPal window open at the same time. Apply any filters manually – Yes, PivotPal does not have an option to apply filters to fields, yet. I have some ideas for this, but can’t promise that it will be in the next release. I think your process is a very common one Laura. I have done a similar process and that’s what lead me to start developing PivotPal. I’m working on another feature that will help solve most of your issues. This feature would allow you to take snapshots of your pivot table’s current setup, then quickly re-apply that setup to any pivot table that has the same data source. This could also include filters. So you would just press a button to take a snapshot of all the settings in that are currently applied in your pivot table, name that setup, then apply it at any time. The features of PivotPal right now will help with some of your processes, but honestly it won’t solve everything for you. When you purchase PivotPal you will be entitled to all future upgrades for free. The price will go up as more features are added, so that might be one reason to get it now. If you choose to wait, I will be notifying everyone of these features through my free email newsletter. Worked with PivotPal for the first time today and already like it a lot. Have to work some more with it to get the most out of PivotPal, but it is already a true timesaver for me. This was a great video and look forward to other videos in this series. I also like your show and tell video on PivotPal. Is it too early to ask how much PivotPal is going to cost? Will there be any bundle discounts if I want to get TabHound and PivotPal? Thanks Walt! I don’t have a price yet but a bundle deal is definitely a possibility. Thanks for the suggestion. I will keep you posted. You are Excelling again….well done. My question is the same as Jim’s …how to quickly remove the drill down pages after you have completed an analysis of some data – but if the extra pages are not created in PivotPal that is very beneficial. Thanks Catherine! Great to hear from you. That is a good question. PivotPal does NOT create the extra pages. Instead it just filters the source data. However, I can see some benefit in having those extra pages if you want to do some quick analysis or something. I will have to think about a way to remove the pages though. I’m not sure that there is anything that tags the sheet or table as being generated by a pivot table. I have been using/developing PivotPal for over a year, and I honestly have not used the drill down pages since I added the Filter Source Data feature. I hope you will find this to be the case for you as well. Thanks again! Thanks for the link. That is a great solution that Mike has created to get rid of extra drilldown sheets. The advantage with PivotPal is that you don’t have to create these sheets at all. PivotPal actually applies filters to the original source data sheet for the cell you have selected in the values area. This means you can review the underlying details in a format that you are familiar with, and also quickly change the filters to do further investigation of your data. With that said, are you interested in having this drilldown sheet deletion as a feature in PivotPal? It is definitely something I could add in the future. Thanks Lou! So if I have PivotPal installed on my machine, create a file with pivot tables & then share that file with others, will the pivot tables work in the conventional way on a machine without the addin? I’m guessing yes but good to have confirmation. Great question! YES, the pivot tables will still work in the conventional way on any machine without PivotPal. PivotPal creates/modifies the pivot tables the same that you would with the built-in field list. It does NOT add any custom code or modifications to the workbook. You can also use the built-in field list while you are using PivotPal. I tend to use both PivotPal and the field list when working with pivot tables. PivotPal is really great for building the pivot table while on the source data sheet. This is something that the field list cannot do, and PivotPal saves you a lot of time with this feature. I’ll share more about this in the upcoming videos. Thanks! This looks like it could be a great time saver. I’m looking forward to seeing it in action. I didn’t see anything in your demo about calculated fields though, are there any features that simplify creating them? You can add/remove calculated fields with PivotPal, just like any other field, but there are no features for creating them yet. I would love to hear what struggles you have with calculated fields and what could make them better. I will definitely be adding features in the future. Thanks! Still wondering… Windows only, or Mac-flavor too? Hi Lynne! Great to hear from you. For the initial release there will only be a Windows version. I plan to have a Mac version in the future though. Sorry, I know you want a Mac version. For anyone else that wants a Mac version, please leave a comment below. Thanks! Thanks, Jon – almost worth getting a Win emulator, but I’ll just pivot old-school while you tinker. I am interested in hearing when the Mac version of PivotPal for 2010 will be released. My colleagues and I would all really love a Mac version! I’ll add a vote for you. Thanks Carol! Looks super!!! Mac-able, or PC-only? When you drilldown (filter source data) is there an easy click button to remove all of the extra pages generated when viewing source detail information? PivotPal’s Filter Source button does NOT create the extra pages. Instead, it applies filters directly to the source data. Sorry if that was not clear in the video. The nice part about this is that you can then analyze the filtered source data and troubleshoot problems. For example, let’s say your pivot table is a YTD sales report by region and after you create it the numbers look way too high. You can select any cell in the pivot table, then click the filter source button. This will filter the source data and show all the rows that are included in the pivot cell. After looking at the data you quickly realize that you forgot to add the date field to your pivot table and filter for this year only. With the PivotPal window open, you can simply click on any cell in the date column of the source data. The field will automatically be selected in the PivotPal window, and you can press the Filters button to add the date field to the page filters area of the pivot. Then go back to the pivot table and apply the necessary filter. I will create a demo video of this to show an example, because it is a feature that will save a lot of time and frustration. I hope this answers your questions. Please let me know if you have any other questions. This looks very impressive and I am very excited about the opportunity to get and utilize this add-on. Many times I want to add a bunch of fields to a particular area and it would be great if you could select all of the fields you want to add and then say, add to rows or add to values, etc rather than having to add one at a time. I didn’t see that option demonstrated in the video but I do see that you have a note under your field list window that says, “Hold Ctrl/Shift to select multiple”. Will the user be able to select multiple fields and add them all at once to a selected area of the pivot, is that only referring to applying formats to multiple fields or is it actually for both options? Great question! 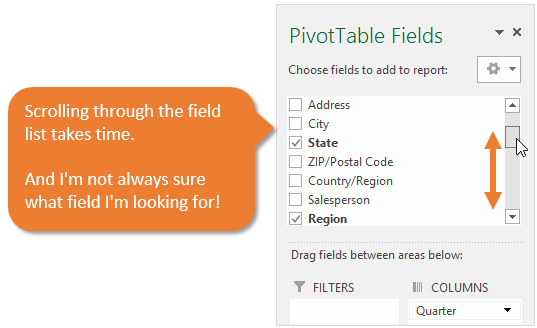 Yes, one of the nice features of PivotPal is that you can select multiple fields in the field list and then add them to any area in the pivot table. It will also work for applying formats. You can select multiple fields by holding the ctrl/shift keys and selecting items with the mouse, OR you can search for an item in the search box, then press shift+enter to select in the list while retaining the currently selected items. This makes it really fast to select multiple items when you know what fields you want to add. You can also remove multiple fields at the same time, which makes it very easy to clear the pivot table. Your PivotPal UI appears to be much more efficient than working from the standard pivottable field list view. 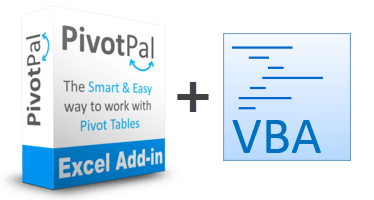 Will the PivotPal be compatible with pivot tables created with Power Pivot data models or only work with regular Excel pivottables? Does the “filter source” & “goto source” funtionality only work if the pivot table data source resides in an excel workbook? 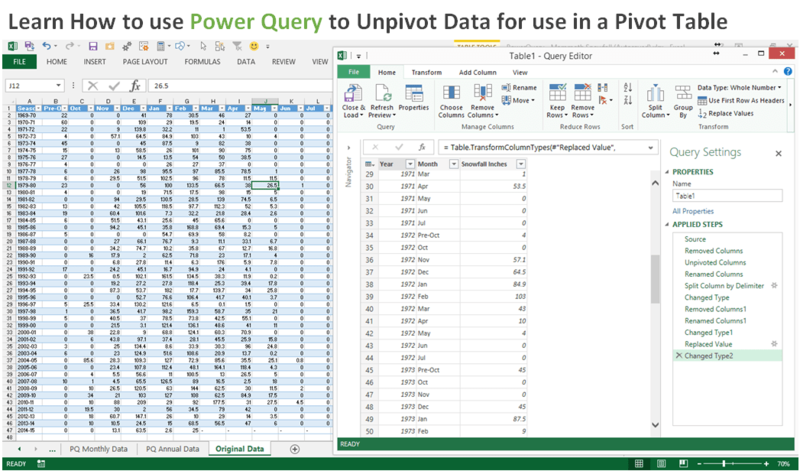 PivotPal will work with PowerPivot in Excel 2013. Unfortunately, the VBA object model in Excel 2010 does not really allow you to work with PowerPivot, so functionality with PivotPal will be limited if any. Currently the filter source and goto source buttons only work if the source data is in an Excel workbook. I guess this could be expanded. Where does your source data reside?